Crikey, I'm doing well on the posting front at the moment! I guess it helps that I've been making lots of cards and so actually have something to show you! I'm so thankful that the craziness of September-December last year has finally died down and I finally have my life back! I really enjoyed making today's card. I've fancied this Motivet image for ages and so was overjoyed the other day when I realised that it was now available in digi form! Isn't she the cutest?! I also got to exercise my other new paper pad which I wasn't technically supposed to buy! What can I say? I have a weakness when it comes to Cosmo Cricket and October Afternoon! Paper: 'Fly a Kite' by October Afternoon. Copic Markers: E00, E02, E11, E29, E31, E33, E35, E37, E50, R20, R22, R27, R29, R81, R83, R85, YG03, YG63, YG67, B00, B02, B05, Y17, Y21, YR23, W1, W3, W5, W7 - available HERE from Dies to Die For. Tools & Embellishments: Whimsy Oval Sentiments Set and gems from stash. Stamp Something - Anything Goes...Stamp Something! Can you believe it is only Tuesday?! It's mental at work because the exams have now started and I am literally counting down the minutes until it's the weekend again! Another beauty Stacey! And how lush are those papers?! Super cute fairy too! More lovely papers, glad to see you are using them too, rather than just stroking them! awww...soooo sweet stacey...the OA paper is perfect with that image! 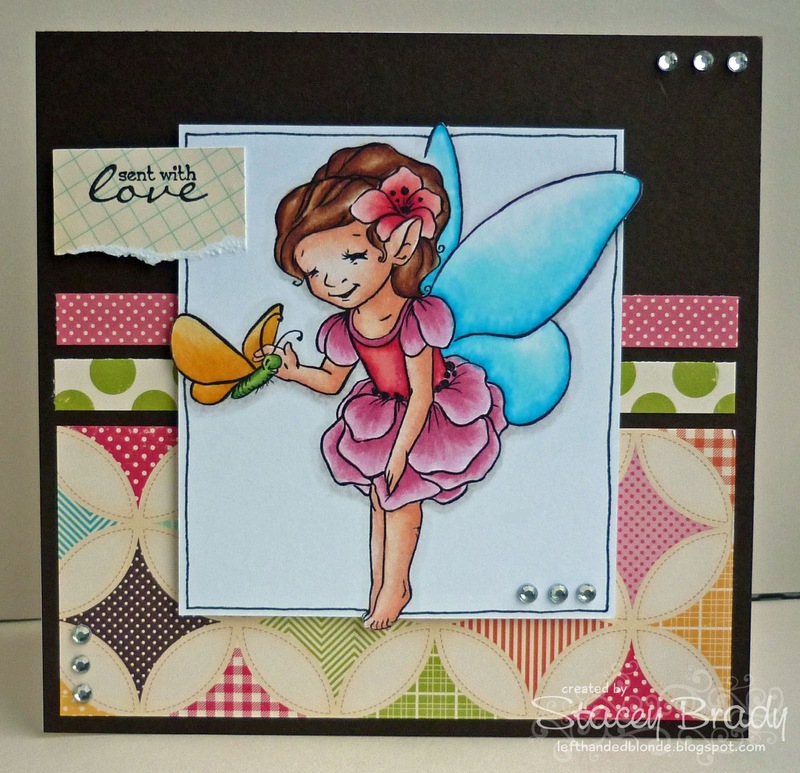 Absolutely beautiful Stacey love the cute fairy. This is a gorgeous card Stacey!! Love your colouringjob!! This is gorgeous hun! The image is adorable and beautifully coloured as always.